Hard to believe, but you can still get a personalized welcome mat, bath robe, towel or other gift for the boaters on your list delivered in time for the holidays. Where? 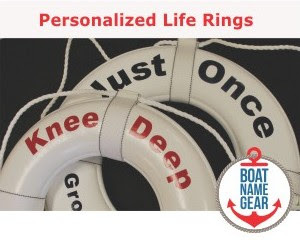 At Boat Name Gear - offering high quality items embroidered with boat names. Sweatshirts, hats - you name it, you can get it - with a boat name on it, at BoatNameGear. But you better hurry if you want these guys to personalize your gift and get it to you in time for the holidays! Check out BoatNameGear now! If your wallet isn't affected by the current economic conditions, and you want an excuse to get out of the cold, you are in luck. There's a medium-sized boat show in Florida this coming weekend. 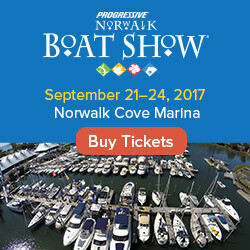 Can you think of a better time to go to a boat show? The economy is in the head, boat sales are down, fuel prices are probably going back up. Yet, I'm saying "YES, go to the boat show." With the economy this bad, your chances of getting a great deal on a new boat are better than ever. According to a news release on the show's website, "the St. Petersburg Boat Show and Strictly Sail Features Great Deals and Incentives on 250+ Power and Sail Boats. The Gulf Coast’s new super show running from Dec. 4-7..." The article goes on to explain that visitors to the boat show will find "best-value deals and incentives offered on a large selection of both power and sailboats for the ultimate Holiday gift." If you can afford a boat, you might as well shop now while the dealers are struggling to move inventory. If you cannot afford a boat right now, it doesn't hurt to go have a look and dream about the day when you can! To help you save, the show's website is offering a $2 admission coupon here, but the link wasn't working at the time of this post.